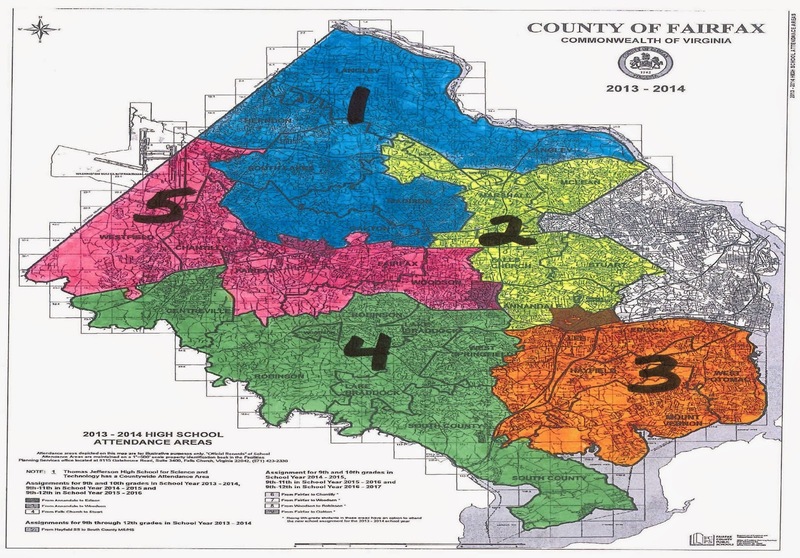 Fairfax County high school pyramids would be divided among five regions. Fairfax County Public Schools Superintendent Karen Garza announced plans May 16 to reorganize the system’s administrative structure. The new system takes effect July 1. The Annandale/Mason area would be in Region 2, the smallest geographically but with the most students. It would include Annandale, Stuart, and Falls Church high schools, which are in the Mason District and already connected somewhat via their feeder schools, plus Marshall and McLean high schools which are farther away and Thomas Jefferson High School for Science and Technology, a selective school that serves the whole Northern Virginia region. Region 2 would have a total of 44 schools, including all the elementary and middle schools that feed into those high schools. The reorganization wouldn’t change attendance boundaries or change the structure within the pyramids. Currently, the Annandale, Stuart, and Woodson pyramids plus Thomas Jefferson are in Cluster 3. The Falls Church, Marshall, and Madison pyramids are in Cluster 2. McLean, Langley, and Herndon are in Cluster 1. According to Garza, the restructuring is being done following nine months of study, including numerous surveys, interviews conducted by consultants, input from staff, and evaluations of how other school systems of similar size are structured. “There were a number of reasons for considering a new organizational structure primarily to help us to be more effective and responsive to our schools,” she said. “I am pleased to report that this new design is also cost effective and will create significant budgetary savings, once fully implemented.” The savings presumably will come from the reduction of cluster offices and administrators. The new organization chart is more streamlined than the current one. Currently eight administrators or department heads plus the interim deputy superintendent report directly to the superintendent. With the new structure, six people will report directly to Garza: the deputy superintendent, director of operations, division counsel, chief academic officer, chief of staff, and chief operating officer. The heads of the new regional offices will report to the deputy superintendent. Region 1: Herndon, Langley, Madison, Oakton, and South Lakes (36,600 students). Region 2: Annandale, Falls Church, Marshall, McLean, Stuart, and Thomas Jefferson. Region 3: Edison, Hayfield, Lee, Mount Vernon, and West Potomac (36,200 students). Region 4: Centreville, Lake Braddock, Robinson, South County, and West Springfield (36,200 students). Region 5: Chantilly, Fairfax, Westfield, and Woodson (33,000 students). I like having Annandale HS and Falls Church HS linked since we are in the area that was switched from Annandale to FC a couple of years ago. The grouping also makes sense geographically looking beyond those two schools. What criteria will be used to determine what are "high-achieving" schools"? Falls Church is very diverse, but also high achieving, doing an excellent job serving its population.